Prasanna Amirthalingam provides an overview of Entity Framework and how it can be used. He shows that it can provide an excellent interface between the Object-oriented model and the relational. The Entity Framework allows developers to work with data in the form objects and properties without having to concern themselves directly with either the stored procedures or functions of the defined interface, or the the underlying database tables and columns where this data is stored. Using the Entity Client Data Provider. Database developers and application developers need to model business processes and data differently. Database developers use a relational model to represent data and develop stored procedures to represent processes. Application developers use the richness of object oriented models to work with business data and business processes. This mismatch between the relational world and the object oriented world can be addressed by using the ADO.NET Entity Framework. This article is based on the ADO.NET Entity Framework that ships with Visual Studio.NET 2008 Service Pack 1 Beta. The ADO.NET entity framework is an evolution of ADO.NET to provide object relational mapping between conceptual entities and the data store. Conceptual entities are standard .NET classes. The ADO.NET entity framework provides a mapping technology to map these conceptual entities to the data store schema of your database. This allows an application developer to work with the conceptual entities without having to be concerned about the underlying data model. 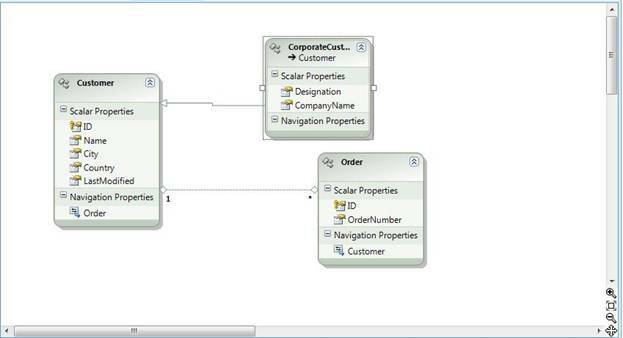 The ADO.NET entity framework uses an Entity Data Model. The Entity Data Model consists of the storage schema, the conceptual schema, the mapping schema and the entity classes. Finally all the defined entity types and associations are mapped into an entity container. The entity types are grouped into an entity set and the associations are grouped into an association set. The conceptual schema describes the conceptual entities as entity types and is defined in XML. This is created to describe the schema of the conceptual entities. Conceptual entity types are .NET classes. Though this schema can be auto-generated, most of the times the application developer would alter the conceptual schema to reflect the model used for the conceptual entities. If the conceptual schema is auto-generated it would simply map a conceptual entity type to a table. The following shows the schema for two conceptual entities named Customer and CorporateCustomer. The CorporateCustomer entity type inherits from the Customer entity type. Entity classes are .NET classes that are generated from the conceptual schema XML definition. The Entity classes are similar to business entities and will be used by the other layers in your application. When working with the Entity Data Model, any changes to the conceptual schema updates the auto generated .NET class definitions. Since these entity classes are partial classes you can extend the functionality by creating your own business logic for the entity classes. The generated entity classes also contain partial methods to plug in your own validation logic. Visual Studio has a project item template for an Entity Data Model. 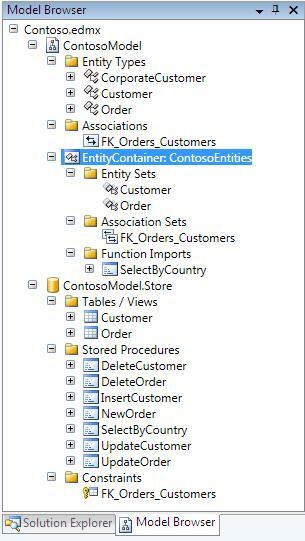 Adding an Entity Data Model to your project allows you to design the conceptual entities and map them to the data store using the Entity Framework designer. You can also create new conceptual entities, create association, and inherit from existing conceptual entities in the designer. When you work with conceptual entities in the Entity Framework Designer, you can use the Mapping Details window to map the conceptual entity to a data store. Visual Studio also has a Model Browser window that shows the conceptual entity types, entity sets and data store. This is similar to the Class Browser window and provides a better view to browse through the Entity Data model. You can change the mode for EdmGen to specify different starting points. For example if you have already created the storage schema, mapping schema and conceptual schema, and you want to generate the entity classes, you can change the mode to “EntityClassGeneration”. EdmGen is very useful when you want to configure it to be used along with an automated build process. Object Services allows you to work with data as conceptual entities (.NET objects). This also allows you to perform CRUD operations on objects without writing query statements that are provider dependent or targeting a particular database product. The CRUD operations for entities are executed through the ObjectContext class. The ObjectContext class also manages state for retrieved entities. You have different ways of querying data through Object Services. When data is queried through Object Services, the results are returned as strongly typed objects. This allows you to work with data as working with any strongly typed object or collection in .NET. The simplest way to query data is by using the ObjectQuery type in .NET. The ObjectQuery type represents a query that can be executed against the conceptual model. An ObjectQuery can be constructed by using the available extension methods such as Where, OrderBy, Select etc. The ObjectQuery always work with an ObjectContext (in this instance ContosoEntities). For example the following code block calls the Where extension method to build the query to return only entities from the Customers entity set where the Country property is Australia. The entities in ADO.NET are Linq enabled. You can use the language integrated query (Linq) features available in .NET 3.5 to query data. The following code shows the same query we wrote earlier using Linq to entities. The above code will select Customer entity instances that are of the type CorporateCustomer. The res variable will hold a reference to a list of anonymous type instances that has the Name and Country properties. You can also use the query builder methods to retrieve few properties of entity instances. Entity SQL is a SQL like query language that can be used to query data. Unlike SQL, Entity SQL uses entities, property names and associations defined in the conceptual schema in retrieving data. The following code block shows the query that we wrote using query builder and Linq to entities written using Entity SQL. You can retrieve few properties of your entity instances similar to how we did using Linq to entities. But when using Entity SQL the results can be returned as instances of the type DbDatRecord. Updating entities retrieved happens through the ObjectContext. The ObjectContext manages state changes on the entity set (inserts, updates and deletes). When the entity set needs to be updated with the data store, you can call the SaveChanges method of the ObjectContext class. This method would execute the required insert, update and delete statements specific to the data store based on whether the entity instances were newly created or updated or deleted. The above code will update the Customer entity instance c1, delete c2 and insert the instance c3 as a new entity to the data store. All the inserts, updates and deletes would occur when the SaveChanges method is invoked. While updating data, the Entity Framework uses optimistic concurrency. Rows are not locked when entities are retrieved, but at the time of updating it checks whether data was changed. You can control the properties of the entity that will be part of the concurrency check by setting the Concurrency Mode to Fixed. If the Concurrency Mode for a property of an entity is set to fixed then the auto-generated SQL statement would compare the original value that was retrieved with the current value in the data store. If there are any conflicts, an exception would be thrown. The above mapping indicates that we want to use the stored procedures defined as functions in the storage schema to be used for inserts, updates and deletes for the Customer entity. The above code creates an EntityConnection object and sets the connection string. The connection string for the Entity Client provider refers to the schema files, the database provider to use and the connection string to the database. An EntityCommand object uses an Entity SQL statement and the EntityConnection object to execute a query that returns an EntityDataReader instance. The data can be retrieved from the EntityDataReader instance. The ADO.NET Entity Framework provides a framework and gives life to otherwise static entity data models. Conceptual entities designed in the development life cycle can be mapped to data stores. This allows an application developer to work with an object oriented model, and a database developer to work with a relational model. Great article. Keep this series going! Can you show a 3.5 sp1 beta example and explain how to have your Datalayer cross a wcf boundary with entity framework? Maybe I’m just getting too old for this stuff (a good possibility), but I for one am getting tired of things like this in which there are umpteen different ways to do things. Note that I am not criticizing you, the author – I appreciate your effort in publishing the article. What would be nice is some context as to what is the “best” way to do things depending on certain factors, i.e., performance. Maybe it is in fact my age that I am starting to have an adverse reaction to having to learn four or five different new “syntaxes” for accessing data with every freakin’ release of .NET. It just gets tiresome after a while. The Cribsheet series is meant for folks like ‘Otay’. ‘For things you need to know rather than the things you want to know’. One of the reasons for this article is that Entity Framework is here, it is important, and DBAs can use the facts in this article to argue back when the Young Turks demand table level access on the baseless and absurd myth that Entity Framework requires it. Knowledge is Strength. Having entity framework means we can code faster than ever. Indeed, it has performance drawback, but with modern hardware it should not be an issue though. As a return, still we can code faster than ever, don’t have to spend most of the time dealing with data, mapping it to the class, and yadda yadda..
Is the SQL queries generated are optmized? -We have an alternative here to map our SPs. Projection of results into objects? -We do projection of results even when we use datasets. And using strongly typed objects would be faster since there is no weight of XML. Mr.Prasanna has given chain knowledge to start development with Entity Framework. It is incredible article, if it helps to get practical knowledge about Entity framework within 30 minutes. When we read his articles we feel it is easy, but, when you apply to work the content of the article, you will feel that he has done a fantastic job for his fans :). This looks like another layer between the database and the objects, that does not much value. It is in my experience better to code any mapping between the database artifacts and the object world. That makes the overall application easy to understand, maintain, and enhance. It is relatively more work, but in the end it may lead to more elegant and simple programs. Sometimes you can’t choose the platform you are coding to. DBAs, too, don’t often get much choice in development standards. We all need to know about Entity Framework, simply because it is there. That’s the purpose of a cribsheet. I think Prasanna has done a good job in showing how it can be used sensibly if there is a will to do so. All something Codesmith and netTiers can do with out the levels and without hand coding. They generate objects that can be made into DLLs for you program, not this XML garbage. The article was good. Not critical of it. Being one of the Old Dogs myself, I am also tired. Keeping up with all of the “better” ways of doing things is very tiring. And, just when you think you reached the goal, they move the finish line.